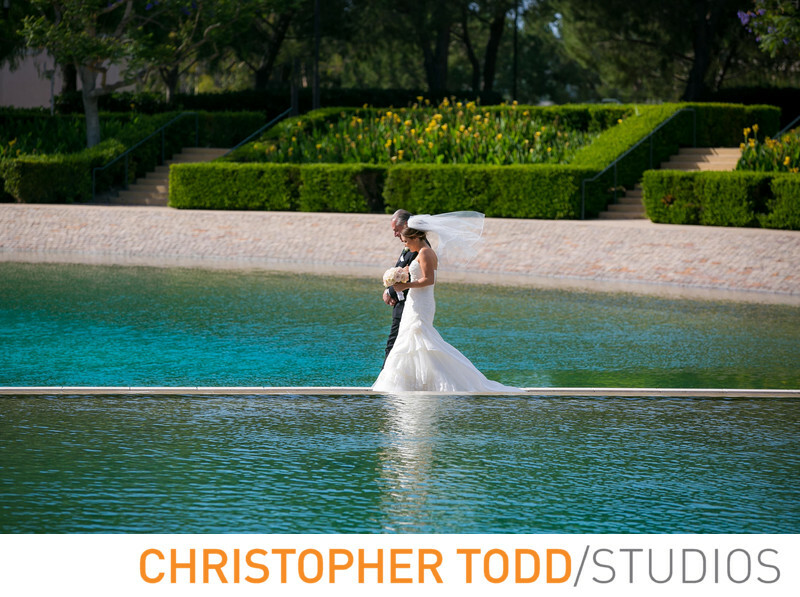 Weddings at SOKA are always photogenic. Mostly because of their wedding ceremony location at Peace Fountain. This photo shows a bride with a blowing veil, and her father walking down the aisle of Peace Lake as they move towards her awaiting groom, bridal party, and entire wedding ceremony. Peace Lake is reminiscent of an infinity pool when shot from this angle. I love this image because it captures the anticipation of a bride in the final moments before her marriage. I also like her veil blowing in the wind which gives the image a more dynamic feel of movement, contrasting the bride and her father's gaze at their feet as they carefully move down towards their ceremony, as not to stumble or trip. If you look at their reflection in the water you can just make out the bride's dress and her veil blowing in the wind. The blue color of the lake reminds me more of Hawaii than California. This photo was extremely risky as a wedding photographer, being that it would be much safer to wait and photograph the bride entering her wedding ceremony from the front in a stationary position. This pick was captured 200 feet away from the ceremony location at Peace Fountain forcing the photographer to sprint back in order to also capture the more traditional photograph as the bride entered the ceremony and saw the groom for the first time that day. I remember being quite winded after I ran around the lake in order to get back before the bride and her dad. 1/1000; f/4.0; ISO 100; 150.0 mm.